If you scratch your head when you see Sunday’s Super Bowl referenced as the Big Game in some ads, you may have dandruff or not realize the tight restriction on trademarked terms. Fact is, the Super Bowl is a trademarked term, and while it can be mentioned in news and conversation about the game, its use for commercial purposes is tightly restricted to authorized advertisers. 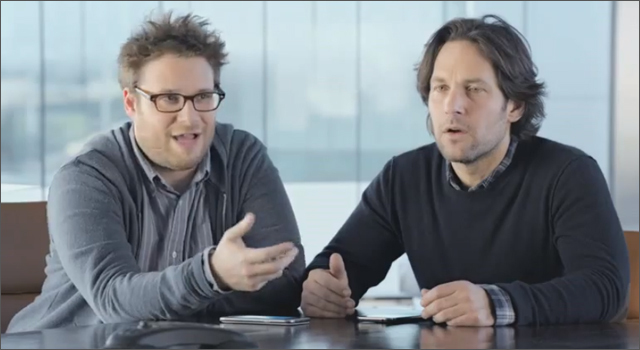 In a new Samsung Mobile teaser, actors Seth Rogan and Paul Rudd are pitching ideas for Samsung’s ‘Big Game’ ad to a marketing guy, played by Breaking Bad’s Bob Odenkirk. They find out that that while they can say ‘super’ they can’t say ‘bowl’ with it. They can say San Francisco and Baltimore, but they can’t say 49ers or Ravens, which are trademarks of their individual teams. The two settle on creating an ad for ‘The Big Plate featuring the San Francisco 50 minus oners and the Baltimore Blackbirds’. The ‘El Plato Supremeo’ teaser was created 72 and Sunny, and directed by Jon Favreau.